If you’re a huge fan of Harry Potter like our family, you will adore this Gryffindor Tie Harry Potter Cookies recipe! These are a perfect treat to make for birthday parties or for Harry Potter parties with family, friends, and other Potterheads like us! 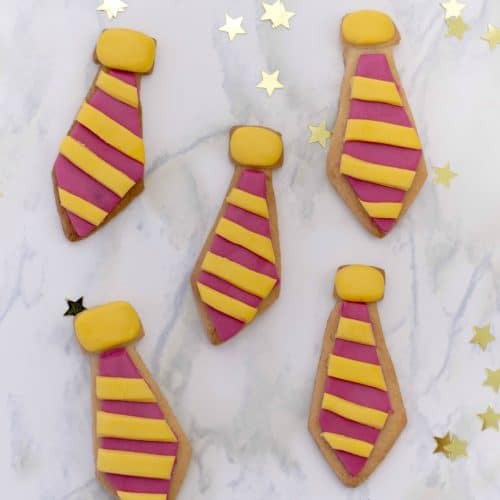 Aren’t these Gryffindor Tie Cookies absolutely adorable and perfect? If you’re hosting a Harry Potter party or get together, perhaps to binge watch the Harry Potter movies with friends, wouldn’t this be a perfect treat to serve for your friends? Perhaps served alongside my Harry Potter Cupcakes with Gryffindor Scarves! Cookies like these are memories in the making. Remember anything’s possible if you’ve got enough nerve! And I say, have the nerve to create these Gryffindor Tie-Inspired Harry Potter Cookies! There will be no foolish wand-waving or silly incantations in this recipe! Ready made fondant swoops in and saves the day, making the creation of these Harry Potter Cookies easy-peasy Ron Weasley. Little ones will need your supervision and guidance if you choose to let them help you cut any of the fondant with you. Prepare your sugar cookie dough according to your cookie recipe (unless you use store bought roll out dough). For this recipe, you won’t need to use a lot of cookie dough, so you can refrigerate any extra cookie dough for later use, for other cookies, or you can double or triple this recipe! Line a baking sheet with parchment paper. On a floured surface, roll out your cookie dough so that it’s about ¼ of an inch thick. Using your diamond-shaped cookie cutter, cut out twelve cookies. Use a paring knife to cut out a portion of the diamond’s sides, cutting on an angle. You will want the diamond to look thinner and begin to take the shape of a necktie. Place each cookie on your lined baking sheet and bake according to recipe’s directions, but keep an eye on it as they are smaller and might cook more quickly. Once baked, remove from cookie sheet and cool completely on a wire rack. Color one bowl of your white fondant with the burgundy gel food coloring. Add as much food coloring as you need until you achieve a deep burgundy color. Color the remainder of your fondant with the yellow gel food coloring in the other bowl. Make a small knot shape from the yellow fondant and place on top of the cookie tie. Roll out each colored fondant until they’re about ¼ of an inch thick each. Cut out twelve small diamonds using the same size diamond cookie cutter that you cut for tie from each of the colored fondants. Using the same technique you used to shape the cookies into ties (ie. : with the cookie cutter and the paring knife), cut out twelve necktie shapes out of your burgundy fondant. To do this, lay the burgundy fondant onto the cookie, and trim away the excess. Press the fondant shape onto each cookie once the size is good. Cut out strips from your yellow fondant diamonds and place on top of each cookie. The strips will be too long, that’s alright, just make sure they’re lined up before trimming. With your paring knife, trim as needed to match the tie shape with the burgundy fondant. Repeat for each Gryffindor Tie cookie – annnd you’re done! Serve and enjoy your magical masterpiece! If you’re a huge Harry Potter fan, you have GOT to make these Gryffindor Tie Harry Potter Cookies recipe! Perfect for parties! Line a baking sheet with parchment paper. On a floured surface, roll out your cookie dough so that it’s about ¼ of an inch thick. Using your diamond-shaped cookie cutter, cut out 12 cookies. Use a paring knife to cut out a portion of the diamond’s sides. Cut out on an angle: you will want the diamond to look thinner and take the shape of a necktie. Cut out 12 small rectangles, about ½ an inch in width and ¼ of an inch in length. Place on the top of your cookie necktie. Place each cookie on your lined baking sheet and bake according to recipe’s directions. Once baked, cool completely on a wire rack. Color 5 oz. of your white fondant with burgundy gel food coloring. Add as much food coloring as you need until you achieve a deep burgundy color. Color the remainder of your fondant with the yellow gel food coloring. Roll out each colored fondant until they’re about ¼ of an inch thick each. Cut out 12 small rectangles (the same size that you cut for the top of your tie), and then press it onto the cookie. Using the same technique you used to shape the cookies into ties (ie. : with the cookie cutter and the paring knife), cut out 12 necktie shapes out of your burgundy fondant. Press the fondant shape onto each cookie. Cut out strips from your yellow fondant and place on top of each cookie. Trim accordingly. Safeway Drive Up & Go Service – I DID IT!